For the first time, the full extended edition of Jackson's movie trilogy will be available in high definition glory. 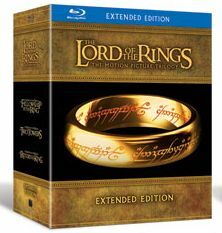 Mark your calendars, The Lord of Rings trilogy is coming out on BluRay on June 28th, 2011. The package looks pretty damn sweet with all three movies coming on 6 BluRay discs. All of the special features stuff looks like it's still on DVD, which seems an odd choice, but I could imagine it would have taken a long time to upscale all that footage to high definition. The best part is that the pre-order price for this set isn't crazy expensive, only knocking you back $84.95 if you preorder it before the ship date. 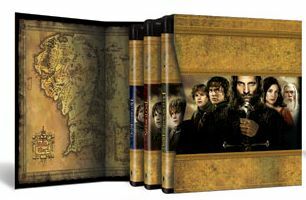 Now, like me, many of you might own the DVDs of all the Extended Editions already, so you may not be jazzed to get this set. The allure of seeing every pore and pockmark on Gollum's face with the increased resolution that BluRay offers may not be enough to throw down almost 100 bones once you factor in tax and shipping. For you naysayers, allow me to point out that the package comes with seven 5x7 glossy photos. Sold! 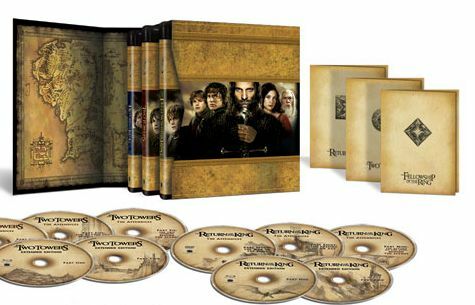 Joking aside, if you don't have the Extended Edition DVD set already, this package is the way to go. I vastly prefer the detail and pacing of the Extended Edition, which adds almost three hours of edited footage to the running time of the trilogy. Moments like witnessing Galadriel give her gifts to the Fellowship, or the procession of elves through the Shire as Frodo and Sam set out, just to name a few moments from The Fellowship of the Ring, increase the authenticity of Jackson's adaption greatly. At the very least, owning these BluRays will tide you over until The Hobbit comes out in theaters in 2012. Preorder it at the WB store now, before the offer to buy them at this price expires. Who knows how much three BluRays will be once it hits the shelves?